Martha Julia “Granny” Warren, 91, of Alton, Missouri was born on April 7, 1928 in Couch, Missouri. 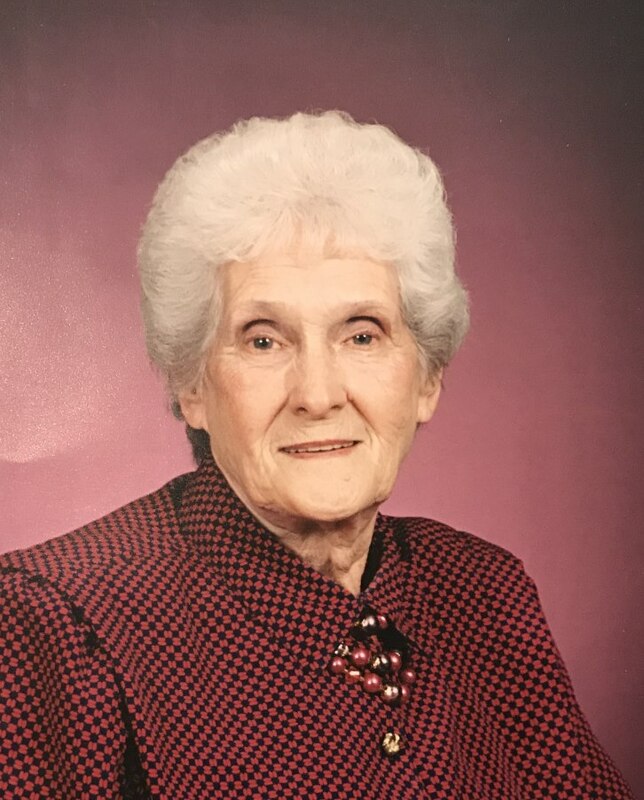 She departed this life peacefully on April 11, 2019 at NHC, West Plains, Missouri. She was born, one of ten children, to Joel Farris Ford and Winnie (Hodak) Ford. She was married to Major Nelson Warren on February 28, 1943 while she was only fourteen years old. After marriage they both resided in Alton, Missouri. Upon this marriage five strong-willed, independent boys were born. While her husband Major was in World War II (German- Belgium- france), Granny had to learn to be independent and take care of things herself. Granny had to take care of the farm and support her family. Her children’s needs were always put before her own. She enjoyed mowing her yard, gardening, and spending time with her children, grandchildren, and great grandchildren. She was saved and served the Lord at a very young age. She was a member of the Whitten Church prior to becoming a member of the Macedonia Baptist Church. She worked thirty-one and a half years at the Alton R-IV School as a cook until her retirement. Martha is survived by five sons; Leo Warren (Maxine) of Thayer, Missouri, Don Warren of Allons, Tennessee, Cleve Warren (Denna) of West Plains, Missouri, Clifford Warren (Laura) of Alton, Missouri and Dennis Warren (Ruth) of West Plains, Missouri. Also surviving are nine grandchildren; Todd, Jeff (Kim), Melanie (Bill), Angela (Brad), Andrea (Matthew), Rusty, Rod (Casey), Derrick, Jeremy (Amanda); 17 greatgrandchildren; two sisters Delora Vest and Olive Bales; one brother David Ford; along with many nieces and nephews, which she loved dearly. Granny is preceded in death by her parents Joel Farris and Winnie, husband who preceded her in death on May 31, 1978; two sisters, Anna Barton and Francis Ford; four brothers, Lawrence (L.A.) Ford, Christopher Ford, Jessie Ford, and Daniel Ford; her father and mother in law, Otto and Ada Warren. Funeral services will be held at 2:00 pm on Sunday, April 14, 2019 at the Macedonia Baptist Church in Alton, Missouri with Brother Joby Steele and Brother Bryce King officiating. Visitation will be held Saturday, April 13, 2019 at the Clary Funeral Home in Alton, Missouri. Burial will take place in the Bailey Cemetery in Alton, Missouri. Services are under the direction of the Clary Funeral Home, Alton, Missouri. Brylee and Hunter. We were sorry to hear about Miss Martha. May God bless both of you during your time of sorrow and remember we are here if you need us. My sympathy to the family. Martha loved to tease me. Most every morning, when she worked in the school lunch room I would ask her if she had learned how to make a good cup of coffee. We shared a lot of laughs about the coffee. So sorry to hear of Martha passing !But know there is a wonderful reunion going on right now ! My prayers are with all of her family an friends! So sorry for your loss she was such a sweet lady always with a smile on her face at school! I always loved when she dressed up for Halloween at school she was always fun to be around! Our thoughts and prayers are with the family!! My thoughts and sympathy to the family. It's always sad to loose someone that brought joy and smiles to everyone she met. She always had a new joke to tell me each time she came through my line at the store. The Warren family has our thoughts and prayers during this time of Martha going to her heavenly home. She made some of the best cobblers ever created. Deepest sympathy, thoughts and prayers to all the family. May God bless each and everyone of you during this difficult time.Our love and prayers are with you. Condolences to the Warren family in the loss of Martha! We enjoyed working with Martha at school. There was never a dull moment around her. I would go to the lunchroom to help supervise the elementary and Martha would always ask if I needed a plate. Most of the time I didn't and she would say. "I'll get you a glass of water and a toothpick then. Years later, when Martha retired, I went to her home with bottled water, a box of toothpicks, and flowers. Martha will enjoy Heaven! So sorry to hear about Marthy.You all are in our thoughts and prayers.Heaven has gained another angel. To the Warren Family. My thoughts and prayers are with you in your time of sorrow.